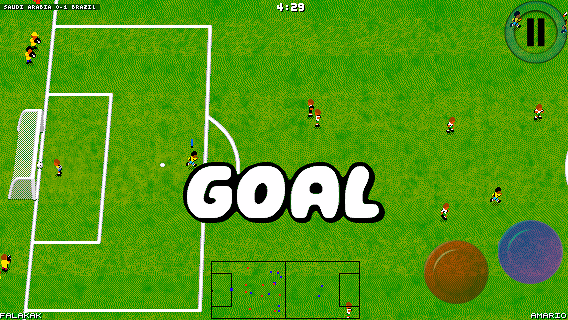 Essentially when you play a football game with your fingers instead of a joypad the main problem you have is the fact that the virtual joystick is less precise and fast than a real one. This means that it is harder to dribble an opponent, but the main problem is that you cannot get the ball from an opponent player in a reliable way, the slower control system is part of the problem, but the automatic switch of the active player is more relevant. What I did, after a lot of testing, has been to disable the automatic active player switch, and let the user activate his controlled player touching it with a finger. The not controlled players of your team will run toward the ball anyway if they are near enough to it, and they will become active if they are able to get the possession. With this change to the active player switch model the game became playable also on iphone/ipod, the older model was playable only on ipad. Another feature I added is the Game Center support. 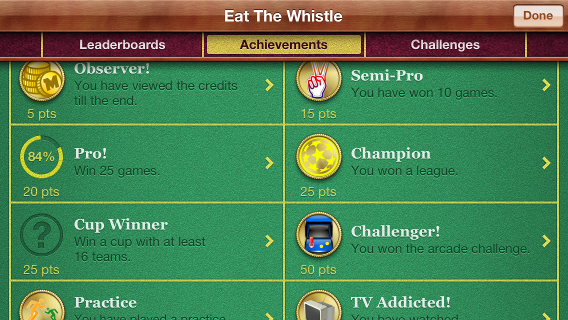 Actually I use Game Center for achievements and leaderboards, but in the future I'll use it also for matchmaking the online mode (still in development...). At the moment there is only a single leaderboard for the Arcade Challenge, this game mode is the hardest of the game, you play an arcade game of 5 minutes against all the arcade teams except the one you have chosen, if don't win you are out. In every match opponent stats are risen, the final team (a secret team!) has all players with all maxed attributes. I've never been able to complete it without cheats, so I wonder what kind of scores will be able to achieve real players! 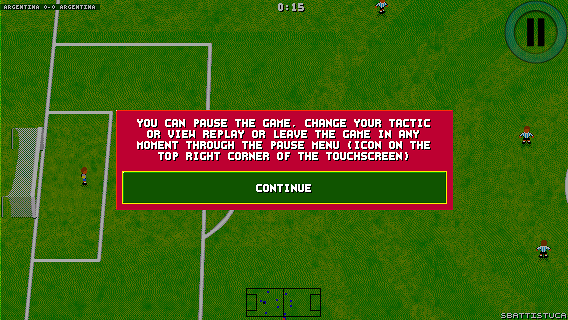 I've also added touch throw ins and swipe free kicks, that has been a fairy simple and quite intuitive feature for the players (at least for the ones I gave the game to test), the only problem that I found with this has been with the replay coherence, I've had to implement a new way to track swipes or touch locations during the game, since I used to track only digital controls and random events to "reconstruct" a sequence. The last feature I want to talk about is the tutorial mode, the original version had a paper manual, and the GPL version a .txt distributed with the game. You cannot distribute a manual with a mobile game, and also if you could no player will waste time to read it. So I added a small, essential, tutorial to explain the basics, the tutorial is made through simple popup windows, every "tip" spawn only once per session, until you don't disable them through game settings, also every tip is show with at least a minimum delay from the previous one, so the tips are annoying, but I hope not SO much annoying to be skipped without reading them or disabled as soon as you open the game for the first time. Playing a complex game without knowing some basic info can be frustrating... I hope this tutorial will avoid this.